Savory Kitchen Table: DO YOU LIKE SNICKERDOODLES? HOW ABOUT CHERRY PIE? CHOCOLATE? DO YOU LIKE SNICKERDOODLES? HOW ABOUT CHERRY PIE? CHOCOLATE? DO YOU LIKE SNICKERDOODLES? HOW ABOUT CHERRY PIE? CHOCOLATE? Who doesn't like all of those? We had a difference of opinion on dessert the other day. I was craving snickerdoodles, but they did seem a bit plain. Hubby was craving cherry pie and my uncle says you can't call it dessert unless it involves chocolate. 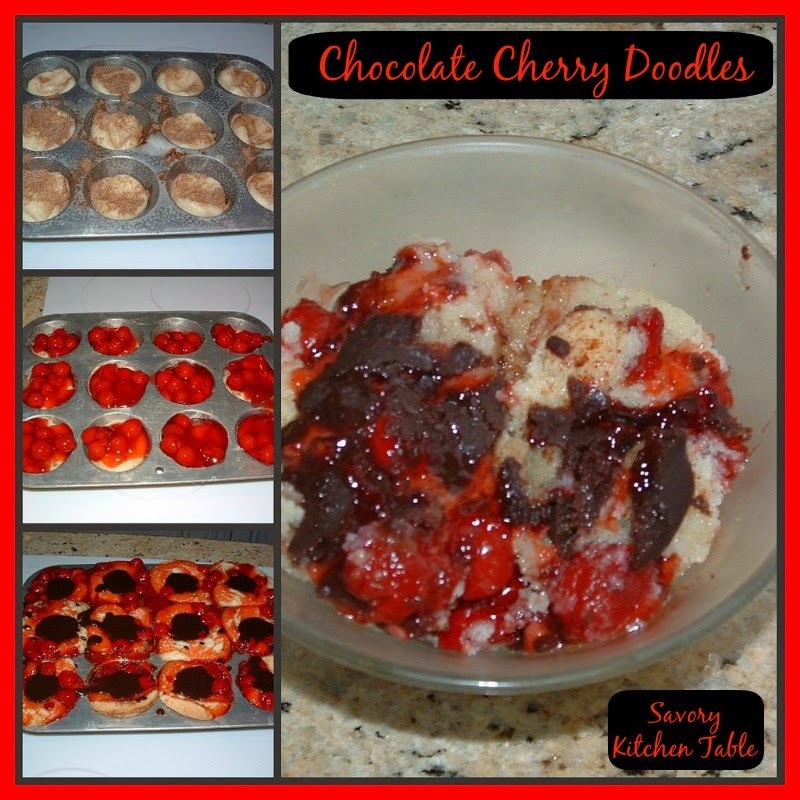 So I set about making what will now be known as CHOCOLATE CHERRY DOODLES! They were supposed to be muffins, but they rise so much they make a much more fun trifle type dessert. Spray DEEP muffin tin with PURE. Cream together 1 1/2 cups sugar, 1/2 cup softened butter, shortening and eggs in large bowl. Stir in flour, cream of tartar, baking soda and salt until well blended, use your hands when necessary. Shape dough into 1 1/4-inch balls. Mix together 1/4 cup sugar and the cinnamon. Roll into 12 balls and then roll in cinnamon-sugar mixture. Place one in each slot and slightly flatten. Divide cherry pie filling among the slots evenly. While baking the cookie dough melt 2 tablespoons butter in a small saucepan. Add the chocolate and blend well. Whisk in sugar until well dissolved. When you remove muffin tin from oven, let cool 5 minutes. Spoon a dollop of chocolate over each muffin slot. Spoon out 2 slots per bowl and ENJOY!